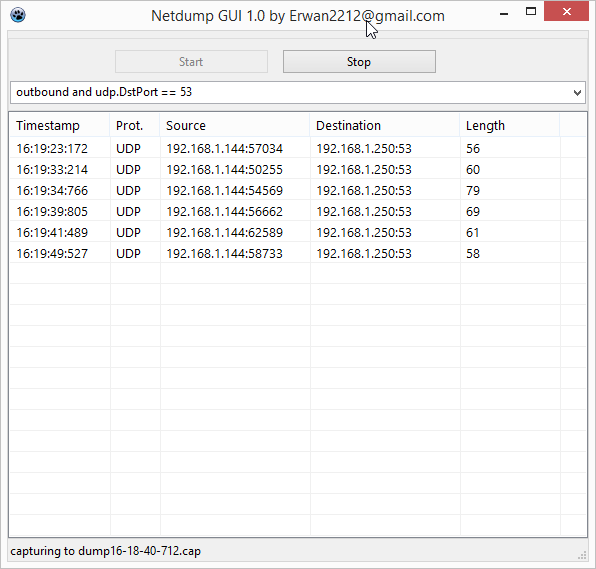 A few days ago, I have shared a, command line, layer 3 network sniffer based on windivert (netdump here). Thus, sometimes it is also nice to have a simple(« start/stop ») GUI. This version will automatically save the capture to a dated pcap file. Still playing with Windivert (see original article here), this time we will intercept dns traffic and will modify the IP address in DNS replies containing A records. The program will dynamically look for hostname to ip couples in a config.ini file. Say that you want labalec.fr to resolve to 192.168.1.144, then you would create the below ini file and launch intercept-dns 53. Additionally, if you set a dos environement variable like set layer=forward, then you can also use this program in a man-in-the-middle attack (which could lead to another article) to divert forwarded traffic. The source and binary is available on my github. In a previous article, we had built a transparent proxy for tcp (outbound) connections. In short any tcp outbound connection on port_x would be redirected to ip:port_z. Main usage was to implement a transparent proxy for http traffic (applications would « transparently » be redirected to a proxy accepting « intercepted » traffic). This time, lets do the same for UDP. One possible scenario : intercept all outbound dns traffic and redirect to another dns server. remember that if you divert to a local app, this local app could be diverted as well. With a rogue dns server running locally (skip the ‘local’ if the rogue server is running on another host). Note the warning about diverting to a local app. For instance, you could be running your local rogue server locally but then since this rogue server will also perform dns queries, you would end up in catch 22 situation. Source code and binaries can be found on my github. Still playing with Windivert (see original article here), I this time decided to code a transparent proxy. Principle is the following : divert a destination port (say tcp:80) to a new destination_ip:port. 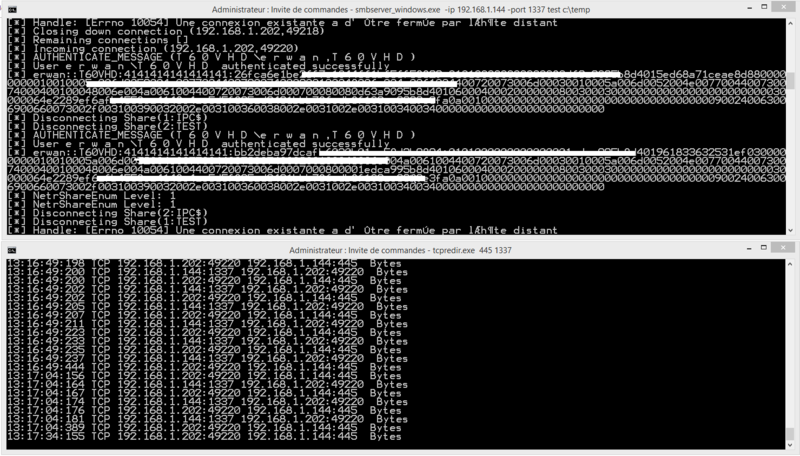 On the destination ip, i am running privoxy (but any proxy supporting transparent mode would do). In privoxy config file, I am setting accept-intercepted-requests=1 . This will be completely transparent for the source application. Nothing really fancy in the code except may be me storing the orginal remote ip (which we will need to re apply on the traffic back) in an array dynamic_source_port=remote_ip. Source code and binaries can be found here. In a previous article, I did comment on a nice opensource library (Windivert) and shared a basic freepascal demo to use it. This time I used this library to redirect (or reuse) a local port used by another application or service to another local port. It could be handy to fool firewalls or to hijack traffic going to a service. One of the best example that come to my mind is to redirect local port 445 to a an application/shell of your own listening on local port 1337. Something you could not achieve like netsh port redirect as the port is already in use and/or used by a kernel service (SMB in our case). The command line would then be tcpredir 445 1337. Source code and binaries on Github. Windows Packet Divert (WinDivert) is a user-mode packet capture-and-divert package for Windows 2008, Windows 7, Windows 8, Windows 10 and Windows 2016. WinDivert can be used to implement user-mode packet filters, packet sniffers, firewalls, NAT, VPNs, tunneling applications, etc. Similar to the raw socket sniffer (here), i have shared a demo (in freepascal) here. Because windivert is a kernel driver, issues inherent to the windows raw sockets will not apply here.